The sky darkens, from a dark grey to a deep mauve. Finally it becomes charred black, like something is rinsing the firmanent of all colour, of all life. The previous calm disappears to be replaced with increasingly fast winds. The sound of these winds is pierced only by thunderous hail as ice rocks hurl to earth, battering all in their way. Ultimately, it arrives, a vast fury of nature. A spinning cloud like no other. It violently wrenches houses and trees from their home with gleeful abandon. The spinning destroyer looms out of the horizon and reveals itself to be a tornado. Tornadoes generate the fastest wind speeds out of any storm system. Speeds in excess of 450 kilometres (280 miles) per hour have been recorded in Wichita Falls in Kansas. 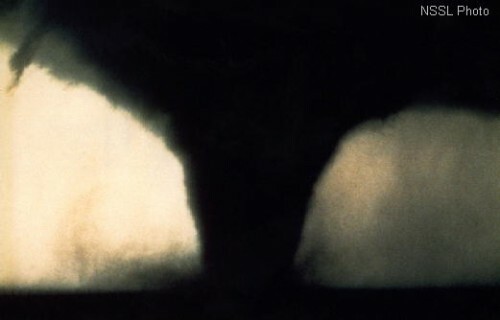 Tornadoes spin like no other type of storm. But they can be even faster with wind speeds reaching in excess of 650 kilometres (400 miles) per hour. Tornadoes can occur on any continent although, as of yet, none have been observed in Antarctica. 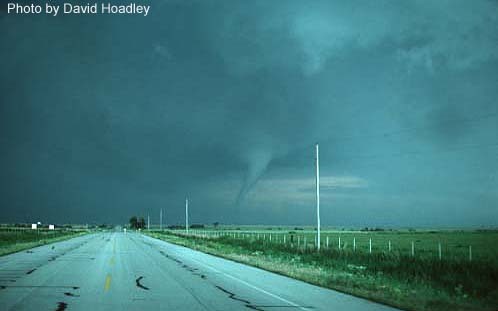 Nonetheless, the one place that is synonymous with them is Tornado Alley, a region of mid-western United States. Every year between 500 and 600 tornadoes hit Tornado Alley causing hundreds of millions of dollars worth of damage and loss of life. In 1925, a tornado killed 695 people in southern-central United States. This tornado was an abnormality in every way. 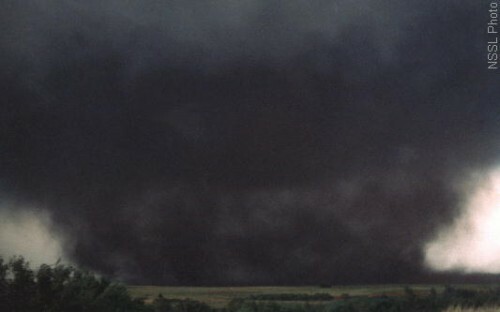 Named the Tri-State Tornado, it travelled the farthest distance (352 kilometres, 219 miles), had the fastest moving speed (117 kilometres per hour, 73 miles per hour) and lasted the longest at three hours and 30 minutes. Although a freak in many ways it was not the deadliest. This dubious honour goes to the Daultipuro-Salturia Tornado which killed 1,300 people in Balgaldesh on April 26th, 1989. Tornadoes need a special cloud formation in order to be born. This formation is a type of thunderstorm cloud called a Supercell. Supercells contain areas of air that are constantly rotating, usually several miles above the surface. Rainfall causes the rotating air to lose altitude and approach the ground. As it hits the surface the instantly recognisable funnel begins to form. When a tornado is created the funnel will form a rotating cloud or a rotating wall cloud. This rotating wall creates powerful gusts of wind that can cause damage several hundred metres or more from the wall cloud. 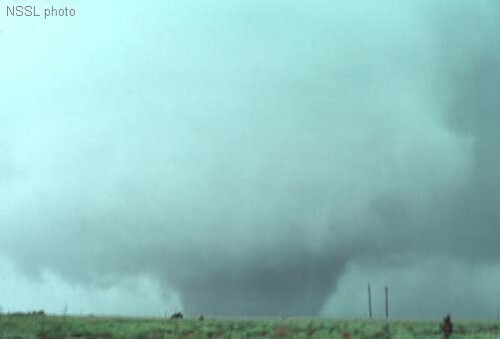 A mature tornado has a steady supply of warm air which is its energy source. It can travel for over an hour and cover up to 100 kilometres (60 miles). In extreme cases, the eye can be over one kilometre (nearly a mile) across. Its death occurs when the very thing that breathed it life, the rotating wall cloud, starts to choke it. The wall cloud closes in and cuts off the supply of warm air causing the tornado to dissipate. Today, two primary methods of detection are used. Radar and satellites. Radar, in particular Doppler weather radar stations, is used to identify patterns that may indicate the presence of tornadoes. 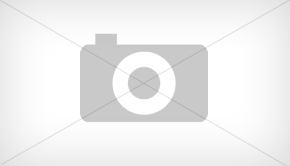 High above the skies satellites such as the Geostationary Operational Environmental Satellites (GOES) are used. While tornado spotting is not the only method of detection the part they play in verifying local tornadoes is still critical to preventing loss of life. Tornadoes are deadly forces of nature and they are not to be taken lightly. Unfortunately, there are many myths and misconceptions that surround them. One of the most common mistaken beliefs is the notion that underpass bridges provide protection. In fact, the opposite is true as underpasses can increase their speed and fling fire debris in the path of people who squat under them for safety. The other great myth is that large cityscapes with their tall, high-rise buildings provide protection. This is simply not the case at all and tornadoes can strike anywhere irrespective of how tall the buildings are or how solid they appear. The only known place that greatly increases the chances of survival are storm bunkers located in basements. The awe-inspiring power of tornadoes and our knowledge of what they can do means that they hold a deep fascination to us. They are an interface between the raw and brutal forces of nature and our own humanity. People travel thousands of miles and cross continents just to get a glimpse of their funnels. Some people get addicted to chasing them. As we learn more and more about our world – our fascination with nature and all it encompasses deepens. Check out Yellow Magpie’s Hurricanes: Nature’s Most Devastating Storms for insight into another force of nature. For those looking at an interesting and entertaining read on the subject of hurricanes, look no further than Into the Storm: Violent Tornadoes, Killer Hurricanes, and Death-Defying Adventures in Extreme Weather. This book by Storm Chasers’ Reed Timmer truly captures the visceral experience of hurricanes and high speed winds. You can obtain Into the Storm: Violent Tornadoes, Killer Hurricanes, and Death-defying Adventures in Extreme Weather here from Amazon. For people living in Ireland or the United Kingdom you can access Into the Storm here. For those living in Canada you can obtain Into The Storm from here. For Germany: Into the Storm . For France: Into the Storm .